Outreach, Screening and Intervention for TraumA (OSITA) is an innovative program which aims to improve the mental health and socio-economic condition primarily for vulnerable Internally Displaced Women (IDW) and indirectly, for their children and families. Effective and timely help for IDWs’ psychological problems will favorably impact their mental health and in turn, contribute to improving their work skills and potential employability. ​​"We are trying to work with IDWs by offering a space where they can feel comfortable, talk and receive something back. It becomes more than counseling, we grow as they improve." The innovation integrates community outreach, screening, and evidence-based mental health interventions in a stepped-care fashion to improve efficiency. OSITA uses mixed methods (i.e. qualitative and quantitative) in two phases: 1) an initial qualitative phase, using mainly focus groups to gather vital information to refine the design of the intervention, and 2) a quantitative implementation phase that pilot tests the intervention. At the start of the project, focus groups were conducted with three groups of participants: 10-15 IDWs, 10-15 IDP community leaders, and 10 healthcare providers representing the three stepped-care levels (community health workers, primary care personnel, mental health specialists). Local researchers and international experts initially drafted a preliminary version of the OSITA intervention, including training and supervision modules, followed by extensive discussions with local health authorities and community leaders. Screening instruments were appropriately adapted for use in Colombia. A telemedicine system to provide support and supervision to healthcare staff delivering the intervention from experienced clinicians based at Universidad de Los Andes. Skype Premium is used to provide the support and supervision, particularly the group video calls feature and capacity to share documents. This is supplemented with a password protected database, stored at Universidad de Los Andes, for basic data on the person discussed in supervision and actions agreed upon. This database serves as a monitoring system as well as a reminder for the health workers. A smartphone or tablet to enter responses to questionnaires and obtain immediate scoring and corresponding advice as to what actions to take. Information captured by the device is uploaded to the central server when the health worker is in an area with internet access. Till now, two IDWs have been hired and trained to serve as vocational outreach workers (VOWs) but also as mental health counselors. VOWs provide brief vocational skills assessment and review available vocational services, especially community income-generating projects and job training courses emanating from the Mayor’s office. VOWs also serve as mental health counselors which include the administration of the screening tests and the IPC intervention when needed. Through a series of meetings with lead personnel (policymakers, health providers, NGOs, etc) the program leads have built a relationship which has allowed the program to be integrated into the current mental health care strategies for displaced people and existing healthcare system. Two thirds of the enrolled participants have come from one NGO as there are very few sources for participant recruitment. For this reason, there hasn’t been any direct recruitment at the household level. Participants have been difficult to reach and some of those that are enrolled often do not attend appointments. Retention of program participants is highly variable. The project team is working closely with key healthcare partners in Bogotá to ensure the program is suitable for adoption into the healthcare system. Additionally the team has established strong relationships with the national and district level psychosocial programs, presenting the project as a “complementary” strategy that potentially enhances existing programs. 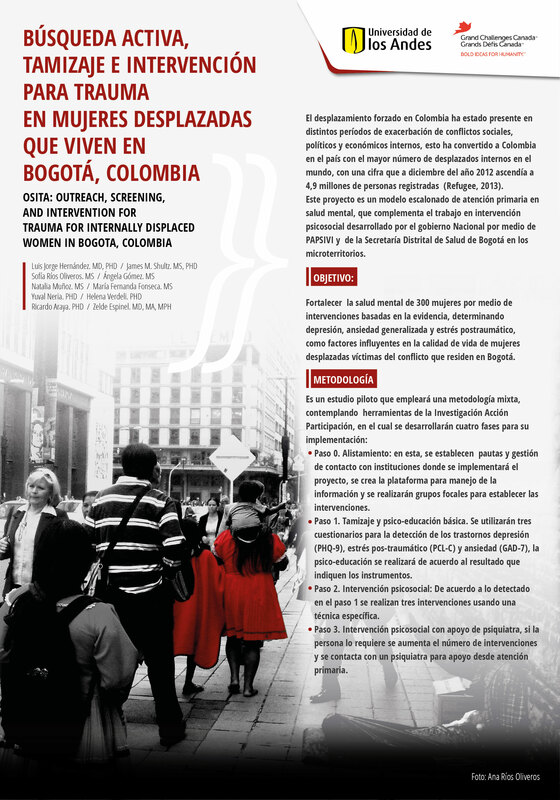 There is considerable receptivity and if the project is effective, these components can be transitioned into the psychosocial programs operating in Bogotá, nationwide and to other Latin American countries. The project has been developed as a randomized controlled trial. Thus far, OSITA has been conducted in the Bogota “localities” of Santa Fe, Martires, Candelaria and Usaquen. The Step 1 sample consists of 300 eligible IDWs who meet the eligibility criteria (displaced women, ages 18-50) and who consent to screening. Based on World Health Organization (WHO) data that 50% of IDPs have CMDs, it was estimated that up to 150 of the 300 IDWs will screen positive for one or more CMDs and that 66% of these 150 “screen positives” (100) will accept the offer of a counseling intervention (Step 2).7 The Step 3 sample was based on an estimation that 50 of these 100 women will require specialty psychiatric referral. The scales that are going to be used to measure progress and impact are: PHQ-9 for Major Depressive Disorder (MDD), GAD-7 for Generalized Anxiety Disorder (GAD), and PCL for Post Traumatic Stress Disorder (PTSD), which are going to be tested for understandability and feasibility in administration. Approximately $215,000 USD over two years. As of October 2014, 71 internally displaced women have received screening and psych-education; 17 of them, with high scores in one or more of the three scales, have improved (symptom reduction). Internal Displacement Monitoring Centre: Colombia. (2011) Improved government response yet to have impact for IDPs. UNHCR. (2014) Internally Displaced Persons. Internal Displacement Monitoring Centre (IDMC) and Norwegian Refugee Council. (2012) Global Overview 2011: People Internally Displaced by Conflict and Violence. Doctors Without Borders/Médecins Sans Frontières. (2010) Three time victims: Victims of violence, silence and neglect. Fazel M et al. (2005) Prevalence of serious mental disorder in 7000 refugees resettled in western countries: a systematic review. The Lancet, 365:1309–1314. Torres de Galvis Y et al. (2010) Indicadores de situación de riesgo de salud mental población desplazada Colombia. Revista del Observatorio Nacional de Salud Mental – Colombia, 1(1):26-38. World Health Organization. (2008) Mental health of refugees, internally placed persons and other populations affected by conflict.